Our Carev Dresser is a lovely product of what reclaimed wood can make. 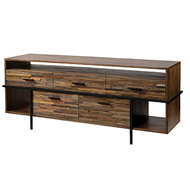 With an array of lovely wood colors, this remarkable dresser is unique in itself and offers a style that can be made to be traditional or modern, depending on its surroundings. With 3 small drawers and 2 larger ones, along with plenty of display space, this dresser will become a pivotal accent piece to your bedroom furniture.